Guess what? ?/ It’s that time of the month again….No, not that one. It’s #BlogBoycottDay! I’ll be honest with you all… I almost forgot about it! I mean how could a month have already gone by? Well, thankfully I remembered and we have all day to spend playing around in the social media playground! There is so much that you can do too on #BlogBoycottDay! It doesn’t have to all about Twitter… there’s LinkedIn, Google+, Pinterest, Tumblr, and of course Facebook. Today in addition to linking up your Twitter handle you can also link up your Facebook fan page and start sharing some great information there too! Facebook allows you to connect with friends, family, other incredible bloggers, as well as amazing brands. If you don’t have a Facebook fan page go ahead and start one and if you have any questions just ask me! 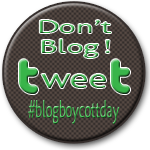 If you want, grab the #BlogBoycottDay button over on the right and add it to your blog post today letting everyone know what you’re doing! If you hadn’t seen my million tweets about it lately then let me tell you that today is #BlogBoycottDay!! What is this? Well, it’s a day of no blogging, of course! Take the time to connect with your friends online and today it’s all about Pinterest! In addition to linking up your Twitter handle you can also link up your Pinterest profile! Now, if you haven’t heard of Pinterest and need an invite just let me know and I’ll send you one. Pinterest has become one of the best things to come along in a while! You can find millions of recipes, craft ideas, fashion secrets, and more. You can find just about anything on Pinterest and without blogging in your way you can spend the day there finding new boards to follow and sharing your great finds on Twitter.